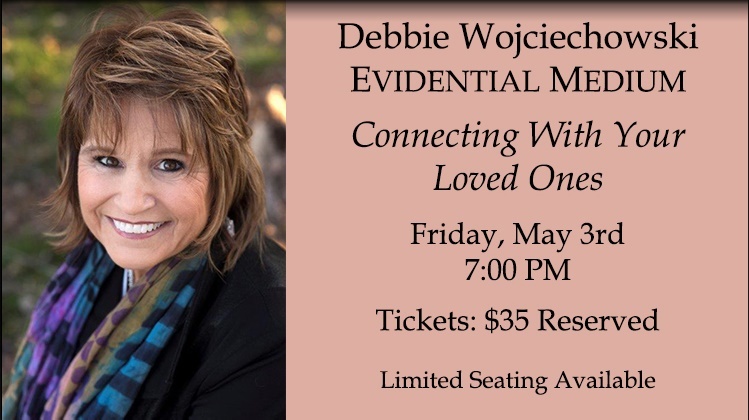 Debbie Wojciechowski, Evidential Medium presents “Connecting with Your Loved Ones”. Evidential mediumship is a style of mediumship practiced around the world that puts heavy weight on the medium’s ability to bring through extremely specific evidence. This evidence can include, but is certainly not limited to, names, personality traits, physical ailments, favorite past times, and phrases often used by loved ones in spirit. The connections often help the recipients to better understand their journey, and help them to realize that a different level of relationship is possible with their loved ones. Even if not all participants receive a message, they will gain an understanding of spiritual communications and the connections that are possible, and how to understand and notice signs from their loved ones. Tickets: $35.